How to say Merry Christmas in Chinese? 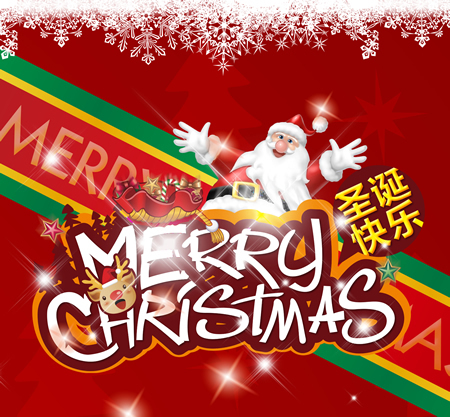 Merry Christmas is Shèngdàn kuàilè 圣诞快乐 in Chinese. Shèng (圣) is sacred or holy, meaning a sage or a saint, dàn (诞) is birth or birthday. kuàilè (快乐) is happiness, joy, delight, or rejoicings. How to say Happy New Year in Chinese? Happy New Year is xīnnián kuàilè 新年快乐. xīn is new, nián is year, xīnnián means "new year." The first day of January is called 元旦 yuándàn in China. "yuán" means “beginning” and “dàn” means day. In Mainland China, December 25 is not a legal holiday. But with the world becoming a global village, Christmas has now become a festive occasion for an increasing number of Chinese as well. Many Chinese enjoy the fun and color that Christmas brings to the drab winter season. Big cities like Beijing, Shanghai, and Guangzhou are gaily decorated at Christmas. Many people give parties on Christmas Eve, and some people enjoy a big Christmas dinner at a restaurant. Shops sell plastic trees and Christmas decorations for everyone to enjoy. However, in small cities and countryside areas in China's interior there are far fewer Christians and the people have had less contact with foreigners, so Christmas is sometimes a foreign mystery, especially for the older generations. Giving gifts is an integral part of the Christmas celebrations in China. People exchange beautiful Christmas gifts with each other. These Christmas gift are the ideal way to express your love and care to the loved ones. Christmas is a two day public holiday in Hong Kong and Macau, due to the British and Portuguese influence. In Hong Kong Christmas Day (December 25) and Boxing Day (December 26) are both official public holidays. Banks are closed on these days. In Taiwan Christmas is generally celebrated more than in Mainland China, but less than in HK and Macau.